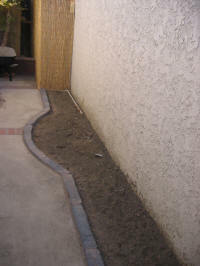 The garden planter is now clear of rocks and debris and ready to add amendments to the soil and plants to the area.. However, the planter space lacks dimension and style. I wanted to add a border of stone or bricks, not only to give the area some style but to keep the dirt and filler rocks in the planter as well. . I wanted an older looking brick whish resembled stone, but was limited in my budget. 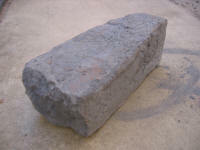 I was able to find concrete bricks which were a grey-blue color, which look like older stone blocks. They looked great, but I found that they were not very sturdy, and I broke a few when I was placing and tapping them in place. Once they are in, and dirt filler behind to keep them in place, they should be ok and stay in place. To keep them in place, I dug a shallow trench and placed 1/2 inch of sand in the bottom I placed the bricks in and left approximately 1 1/2" of the brick above the walkway. In order to keep them in place, I tapped then down into the sand a bit. This is where I ran into a few problems with the bricks breaking. I decided that it was not a big problem, as the variations in the sizes actually gave the brick border a nice aged look. My goal is to create a Japanese garden which looks somewhat aged and established. Therefore, the slight imperfections in the materials is exactly what I want in creating the garden space. 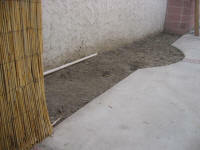 After placing all the bricks, I pushed sand into the cracks and behind to help secure them in place. 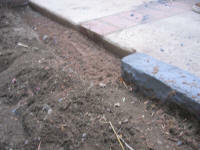 I tamped down the sand and dirt in the planter behind the bricks to help keep them from moving as well. The result is a nice added feature to the garden which gives character and color to the area.